*	The 'Options' (A) button allows you to adjust the screen, music, cursor, and sound. *	The 'click here to change player' button (B) can be used to add or delete a player. *	Go to 'Extras' (C) to access the Bonus Content in the game. *	In this guide, we will refer to Hidden-object scenes as 'HOS'. Hidden-object puzzles will be referred to as 'HOP'. *	items written in green in HOS require an additional step. *	You can skip a puzzle once the 'SKIP' button fills. *	You will receive an invisibility potion at different points in the game; you will not be able to access certain areas without it. 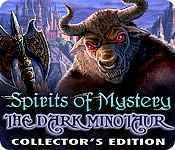 Sign-up to get informed when the Spirits of Mystery series has new game released with BD Studio Games' FREE bi-weekly newsletter.